Thought it best to get Lenore on the Turibus to get her bearings in this huge city and being a Saturday and March rather than January as last year, it was a much slower trip with many more people. 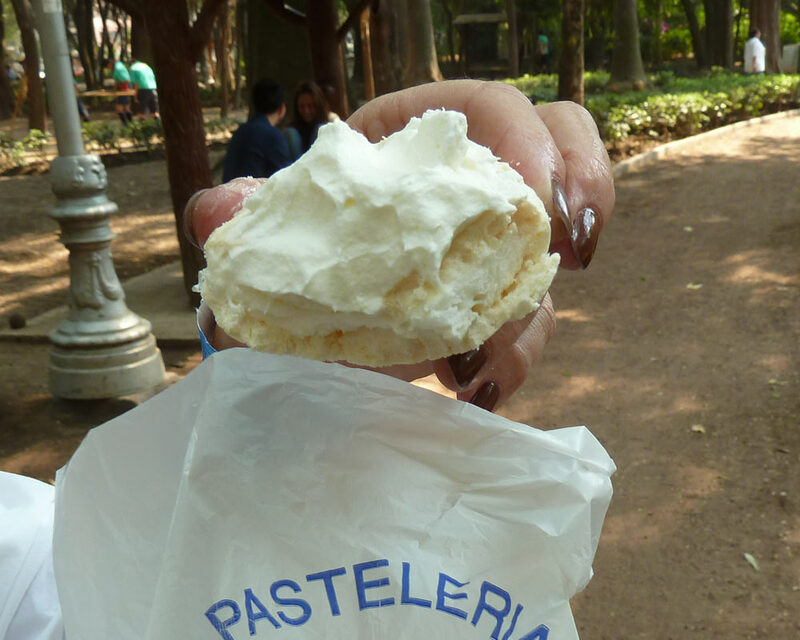 We got off at Condessa and wandered around for a couple of hours – found one art gallery plus recommended food dispensers for the best tacos and the best pastries (merangues filled with creme). We were trying to follow a walking tour in the Opinionated Guide, but in Condessa there are three concentric oval streets – which therefore intersect twice with each of the cross streets. Made it very interesting to find things at the intersection of X & Y. We did a lot of oval walking. Eventually found the bus stop and hopped back on for the rest of the circuit. 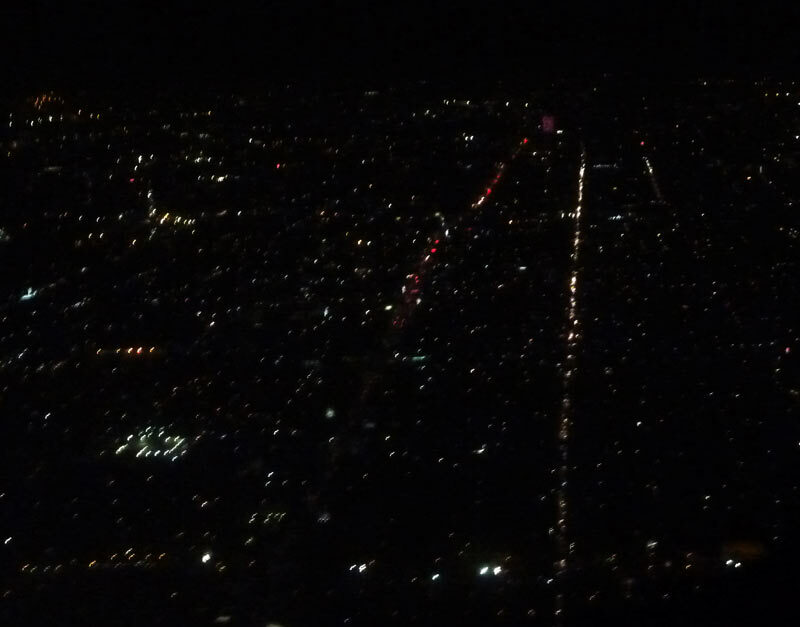 Got back to the hotel around 5 and after a limonada and an almost-nap, we had dinner and dropped dead for a dozen hours. 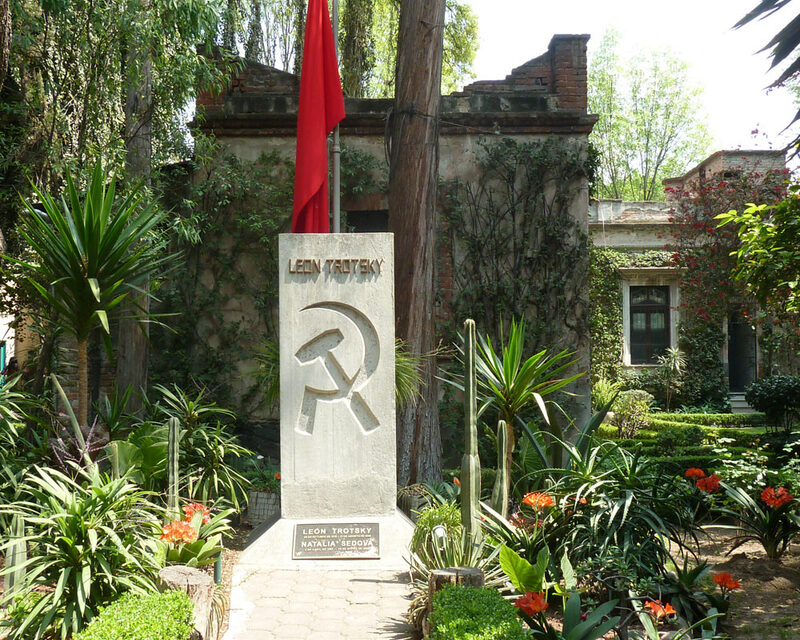 Day 2: This morning we’re planning to attempt the Metro and tour Coyoacán where both Frida K and Trotsky lived. More later. OK, now it’s later. The Metro was nothing to be worried about (I had been told otherwise last year, but glad I took it today). It’s fast and clean and everyone on it looks just like subway riders everywhere – sleepy, busy with homework, chatting, and mostly ignoring everyone else. 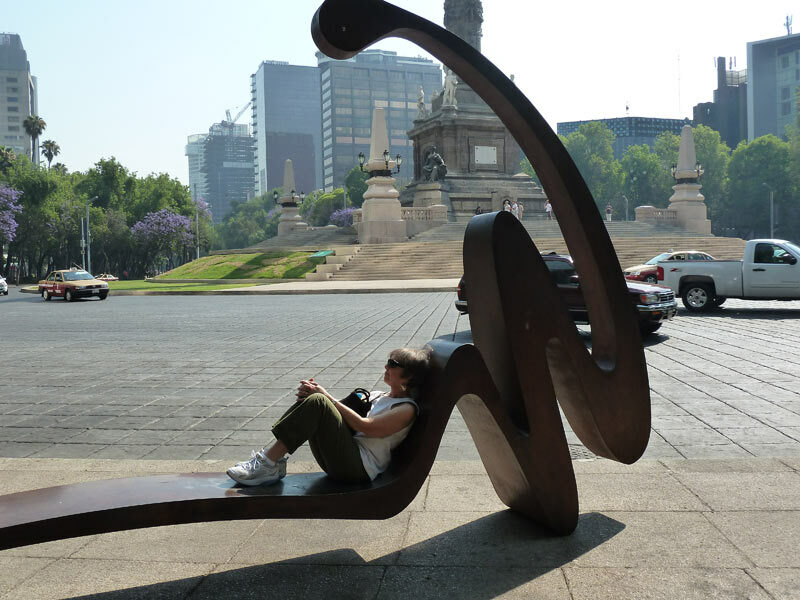 Anyway, before we got to it, we discovered the Paseo de Reforma transforms itself on Sunday Mornings. Free dance classes, exercises, bikes everywhere (no cars) and trips up to the top of the Statue in the middle of Independencia. This photo may give you a taste. 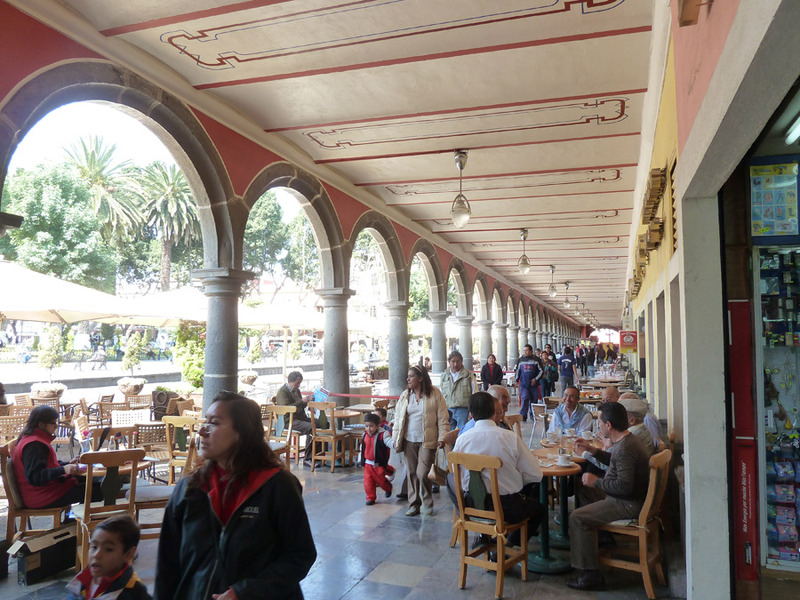 Coyoacán is a lovely place – about 10 miles south of Mexico City center and still part of it, but really like another town. Very colonial, beautiful and vibrant. Trotsky’s house/museum was worth the whole trip – we spent a couple of hours there with a fantastic guide – and then fell into a viennese cafe for lunch. 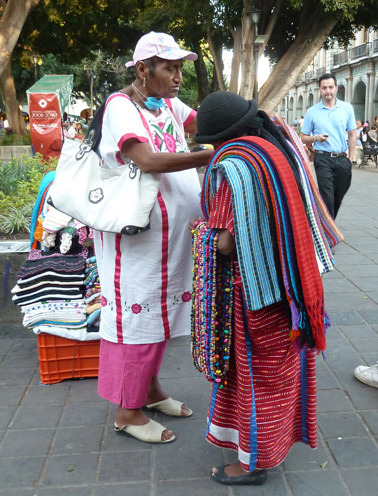 By the time we left Frida Kahlo’s house we were beat. But we plowed through the town market and took some wonderful photos of wares, food, people, lots of kids – all of which will be in an album when I finally get to that part. 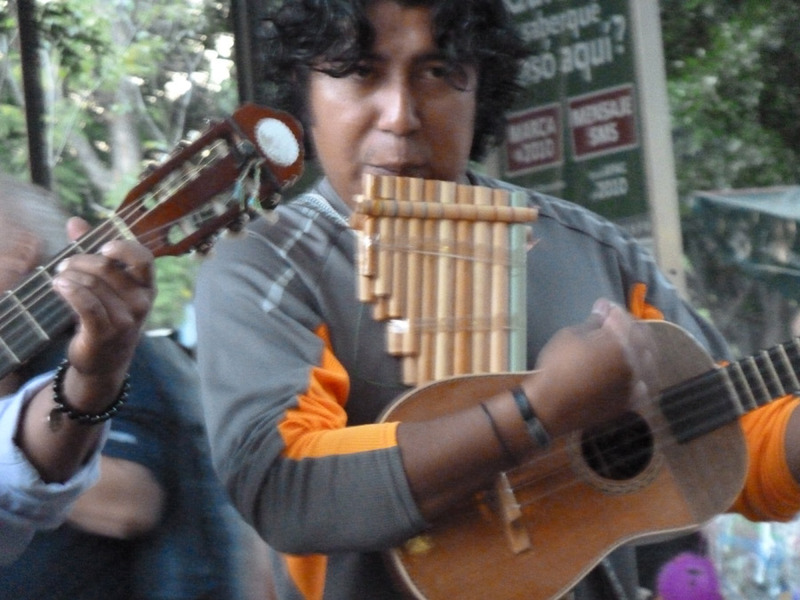 There is a lovely park in the center of Coyoacán where again, people were dancing – though this time they were at least middle aged and danced as couples. They were very serious about it and clearly enjoyed this Sunday activity. Walked another mile or two and ducked into a Starbucks (!) for a very welcome coffee and rest. If you know what I think about Starbucks, you’ll know how beat we were. 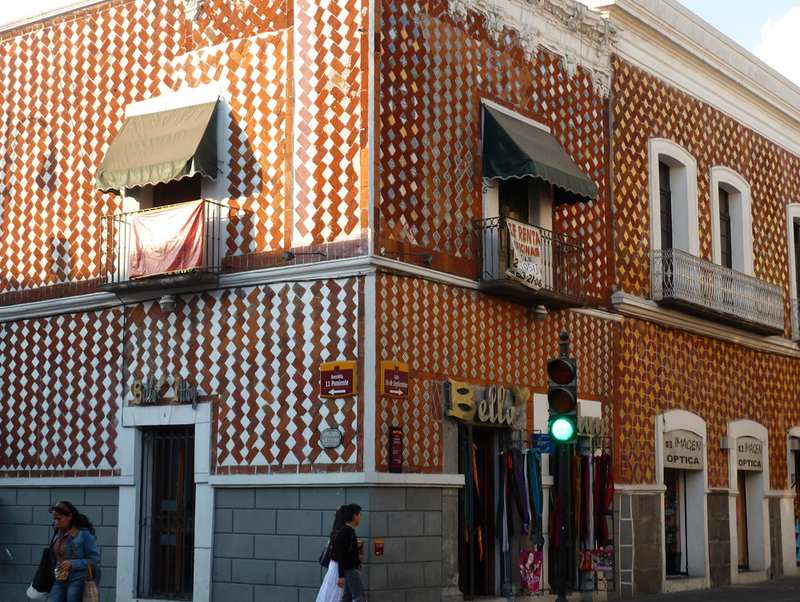 Coyoacán has a cobble stoned street called Salvadore Novo which houses a watercolor museum – possibly the only one in the world – and many stunning mansions. We toured that part of town in the rain on our way back to the metro. Along the way was the house Dolores Del Rio lived in. 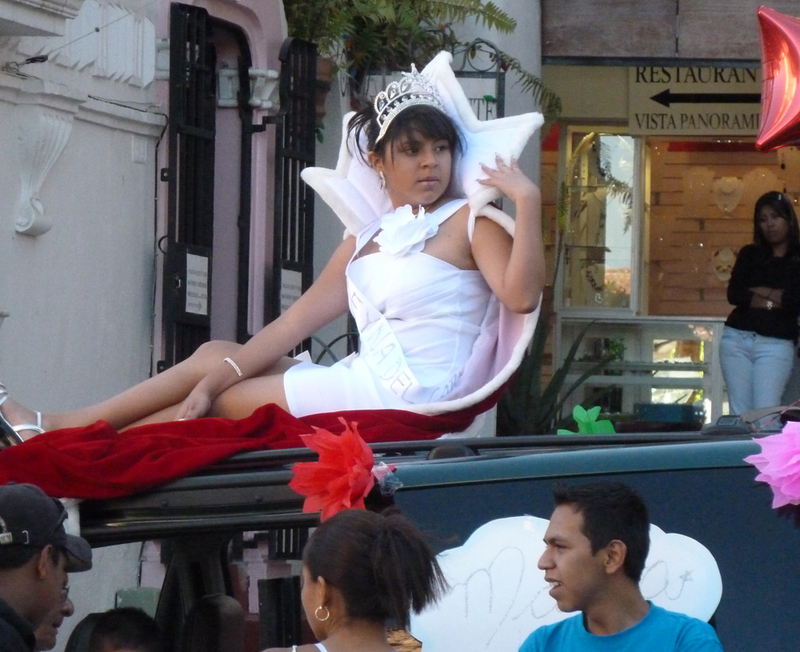 Anyone out there remember her? Dinner at an Argentinian cafe and back to pack for tomorrow’s adventure. The weather’s been warm in the evening and we wandered up and down sidestreets last night finding wonderful spaces. People (mostly teenagers) were hanging out in the zocolo when we turned in around 10:30. Only bought two rings and one pair of earrings yesterday! It’s now around midnight and I’m in the hotel lobby finishing this page so I can pack and get up early for the trip to Puebla. Today was fun! We woke up early to marching band music – turned out it was a day long carnival in preparation for tomorrow which is Ash Wednesday. We wandered around the town a bit and then took a collectivo ride down to the barrio called Arcos where we found the teliferico (just like a gondola but without the snow). A nice ride up to a hotel on top of a mountain which had an incredible view, a country club (! ), several fancy cars parked outside and some nice silver shops. After not buying anything, we had coffee on the terrace and decided to have lunch there. The food was definitely not a high point. I sent back my ham and cheese sandwich when I saw the queso looked suspiciously like Kraft American and ordered tuna instead. Lenore topped hers off with flan which had kalua in the caramel and was way too sweet. But then we took the cable car back down and discovered a treasure. An gated space inside of which were some very old buildings and lush vegitation turned out to be a school for arts. 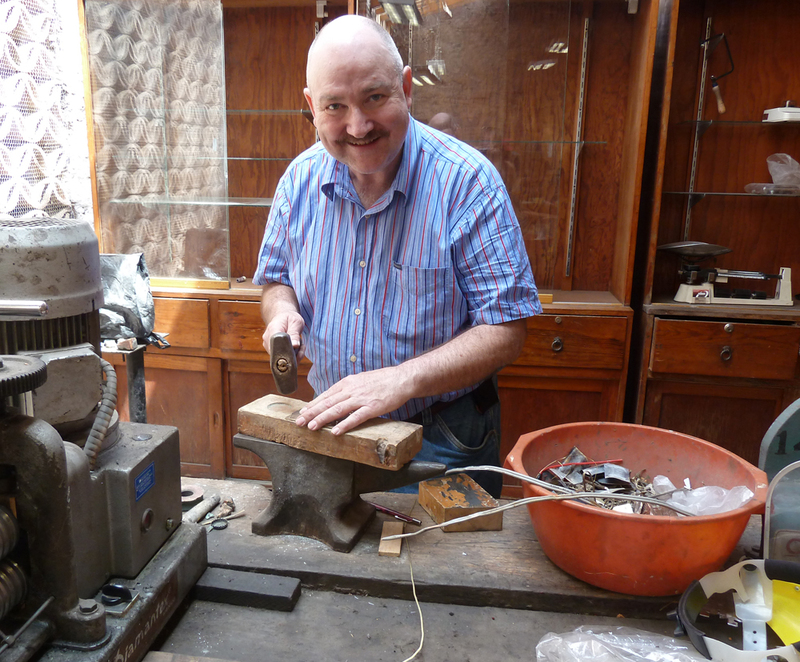 We were allowed to walk into a jewelery workshop talk to the maestro and one of the students who turned out to be a fine jeweler from Minnesota! 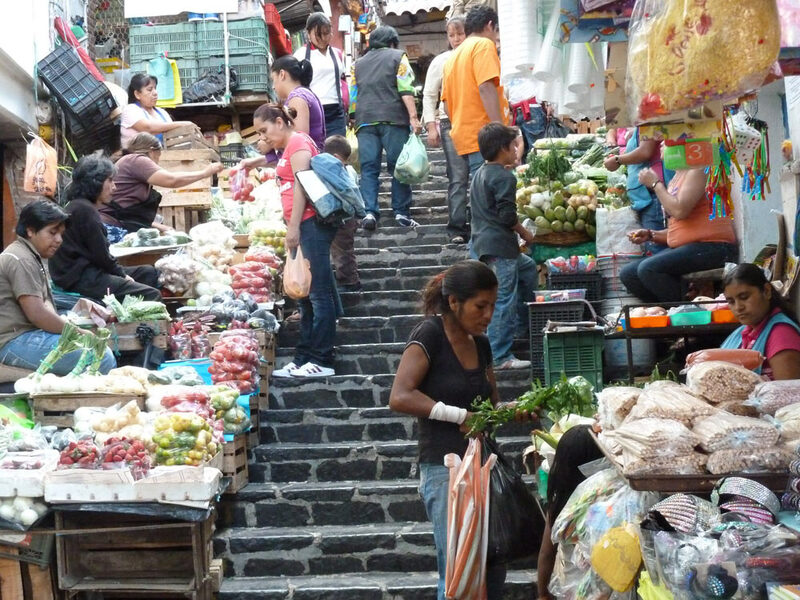 Once back to Taxco, we hit the silver stores we had missed and collected several more essentials. 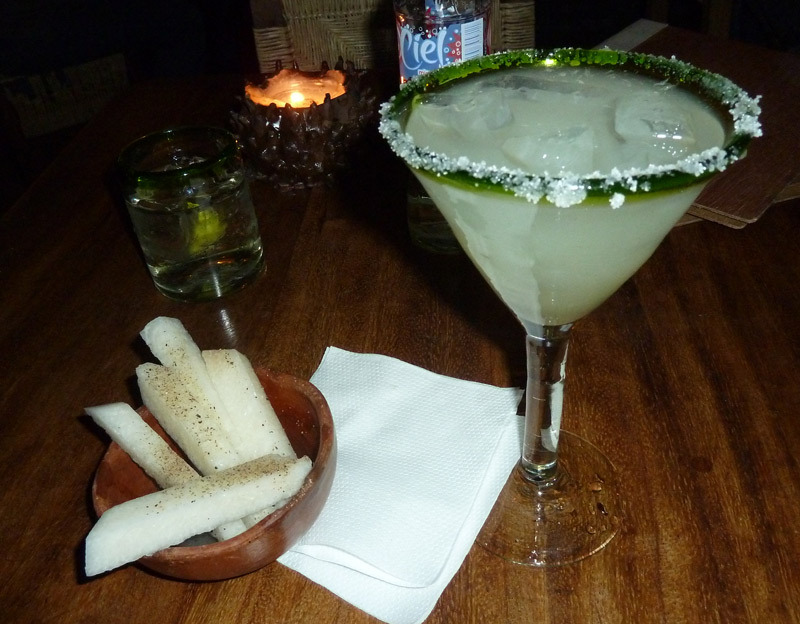 By then it was time for a really lovely dinner on the terrace of El Adobe (recommended by one of the jewelers). We got back to the zocolo in time to watch the fireworks. 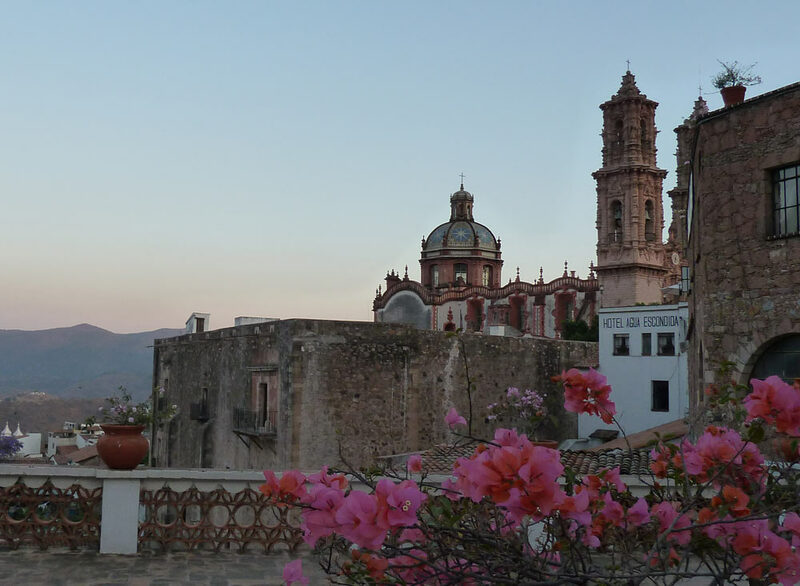 We’ve both loved Taxco – the people, the sights, the silver of course and the weather; apparently we’re in for a little rain in Puebla. Two bus comfortable rides and we landed in Puebla, the 4th largest city in Mexico and the only Colonial city not build on top of indigenous ruins. 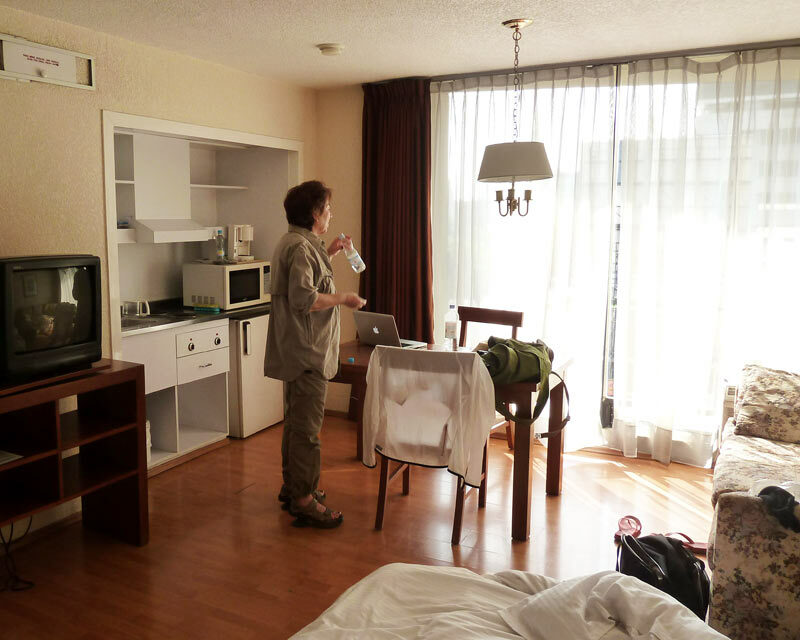 We’re staying in a posada – very attractive and on the Zocolo which is arcaded like Bologna (& I guess many other places) but the first I’ve seen in Mexico. Beautiful. 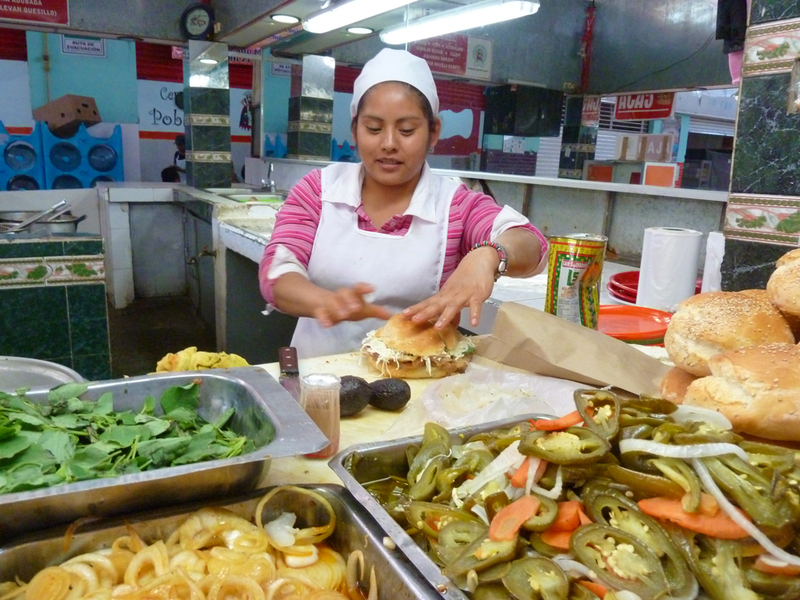 We walked around in the afternoon and found the highly recommended Cemitas de la Poblano at an old market. We thought we were having a late lunch, but after half we were too full to continue and it was too good to waste. The other half became dinner. After ‘dinner’ we found the arts & crafts market, mostly knockoffs of the famous pottery and other souvenir items. Nothing to tempt us here. The ‘hotel wide wifi’ did not seem to include the room, so I sat in the lobby until the wee hours catching up on work and communication. This morning (it’s now Thursday) I’m in the restaurant with coffee and macbook. 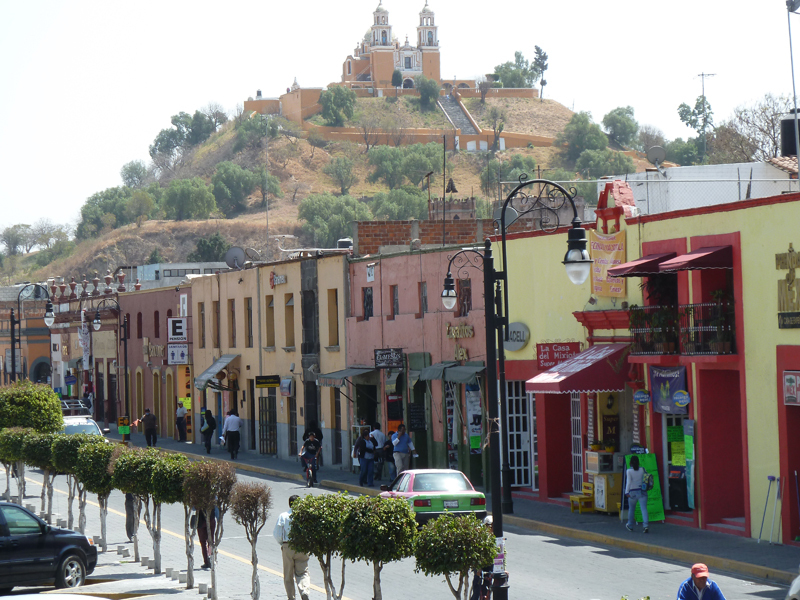 We’re going to Cholula today, place of 365 churches – one for every day – and the largest pre-columbian pyramid in the world. 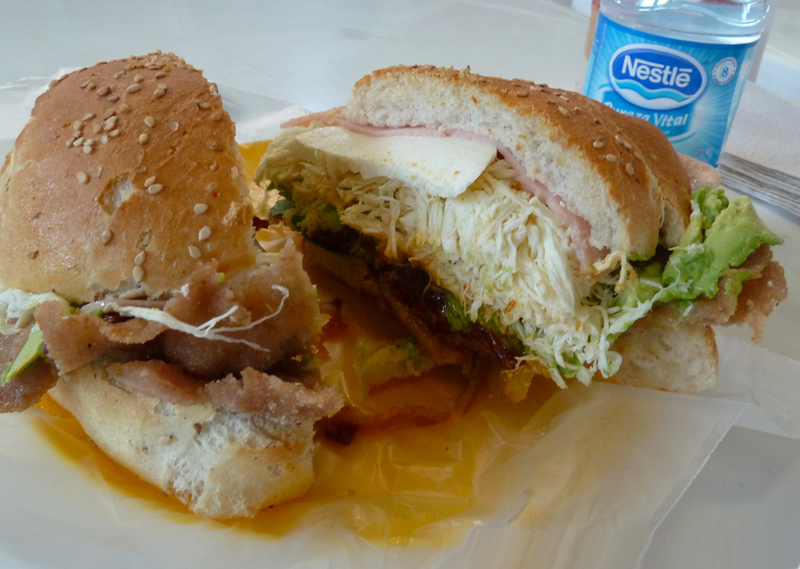 A little climbing after that cemita won’t hurt. 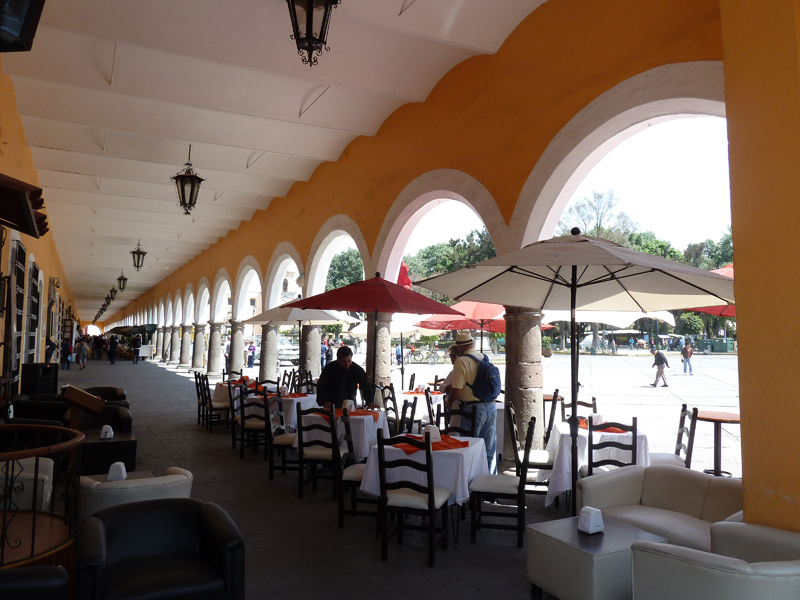 Then we plan to enjoy the best mole poblano there is, at least according to two guidebooks. 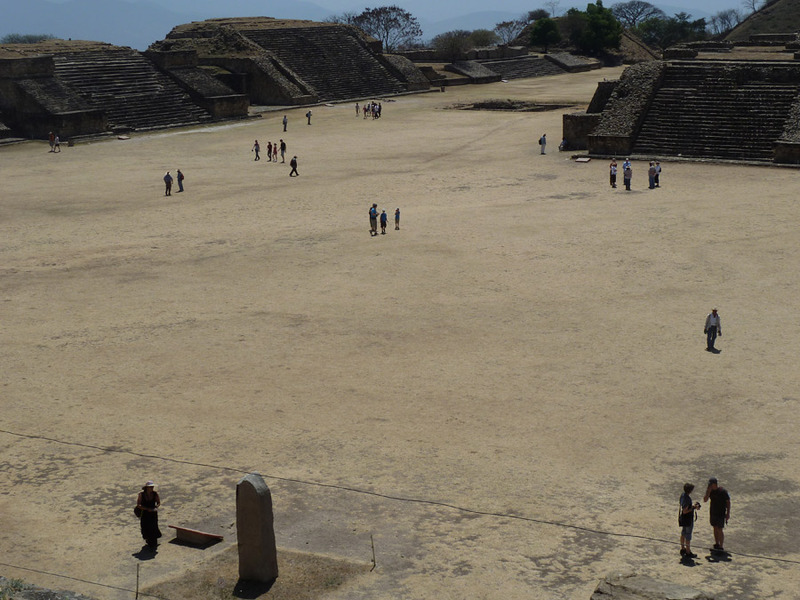 So, end of another nice day – a bit of building watching this morning and then a bus tour of Cholulu, about 20 miles away from Puebla and housing 365 churches and the largest pre-colombian pyramid base in the world. Turns out there’s a church built right on top of that base (which we climbed up), but there used to be a temple built by the Indians. Don’t know which ones. 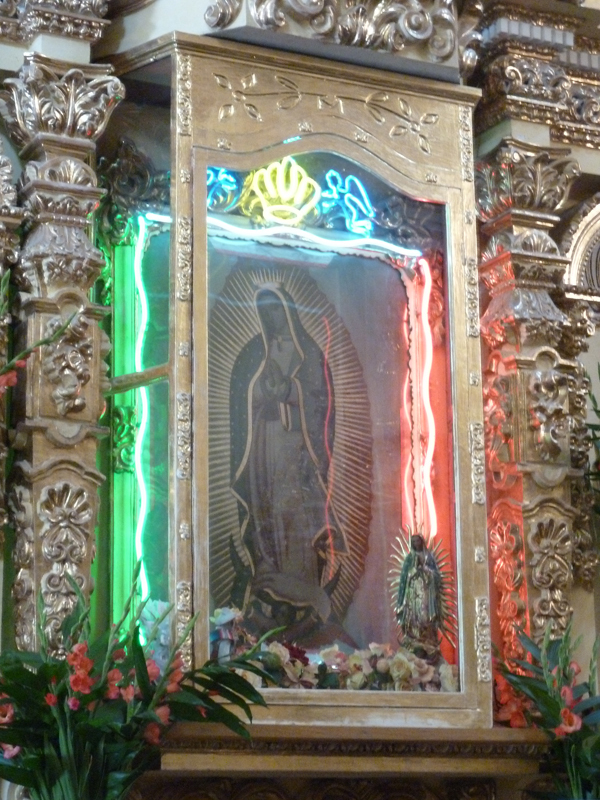 Cholula is mostly about church gazing – we stopped at 4 and some really are quite amazing, but we also found the best coffee of the trip so far. 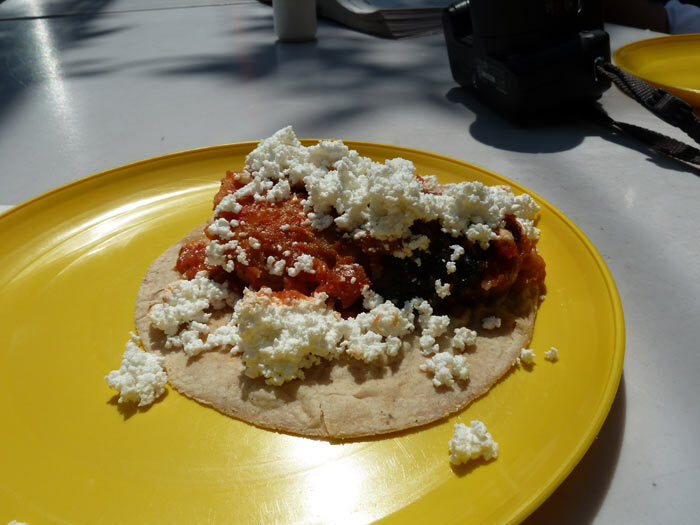 We got back to Puebla and went to La Mural for our necessary meal of authentic Mole Poblano. It’s written up as the best purveyor of it and I can’t argue. It was truly delicious. I had a ‘sampler’ of mole poblano, pepian verde and pepian roja. Then we had to have flan. No rain today, despite prediction and it looks like Oaxaca will be sunny the whole time we’re there. After a 4.5 hour bus trip through some lush farm land and climbing up into masses of mountains, we arrived in Oaxaca City. Our B&B is even better than anticipated with a lovely colorful courtyard (where I’m sitting now writing this) owned by knowledgeable, charming Maria – who has lived in San Francisco and London among other places. 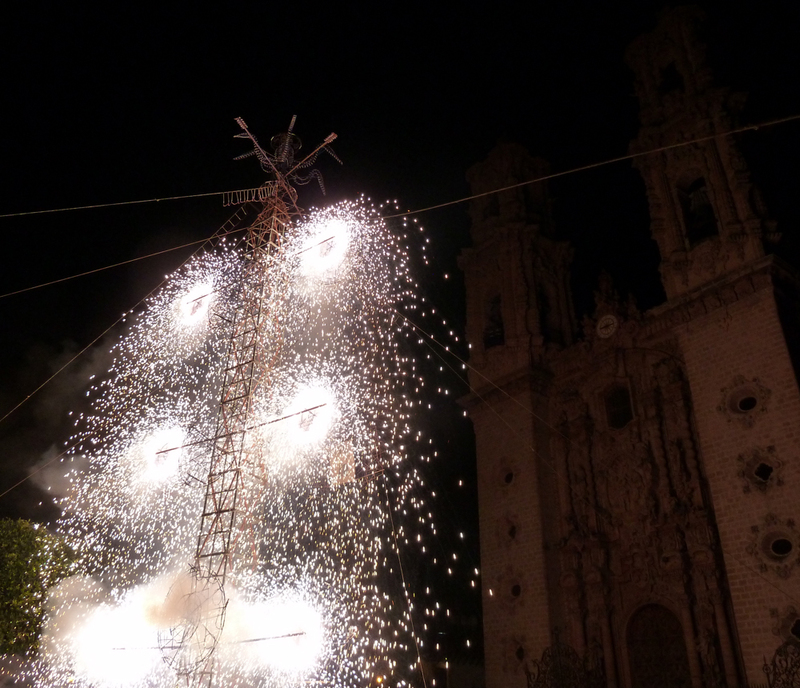 We wandered the historic center last night, had a drink in the zocolo, entertained by pan pipers and colorfully dressed vendors, visited some galleries with an eclectic variety of international art (including 4 photographs by the Westons), and some craft stores, and had an incredible Oaxacan meal. 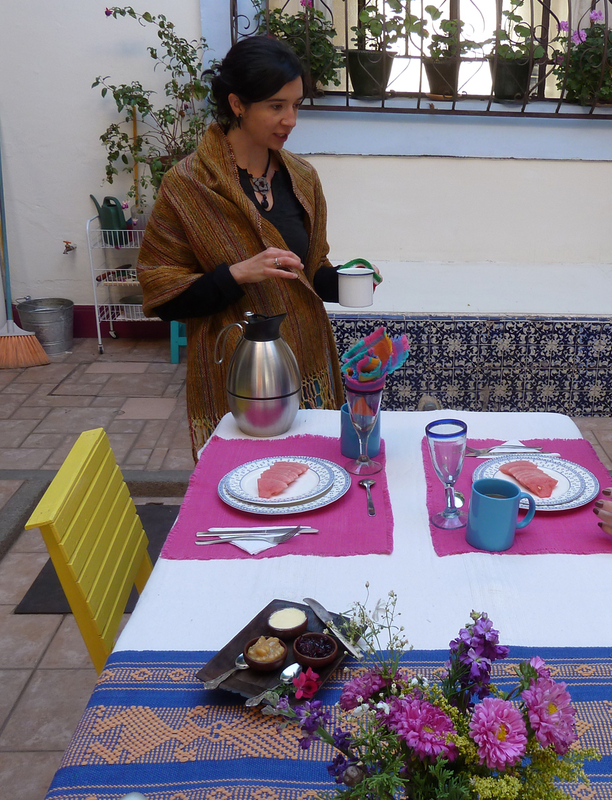 Started with a delicious breakfast served by are lovely B&B hostess, Maria. 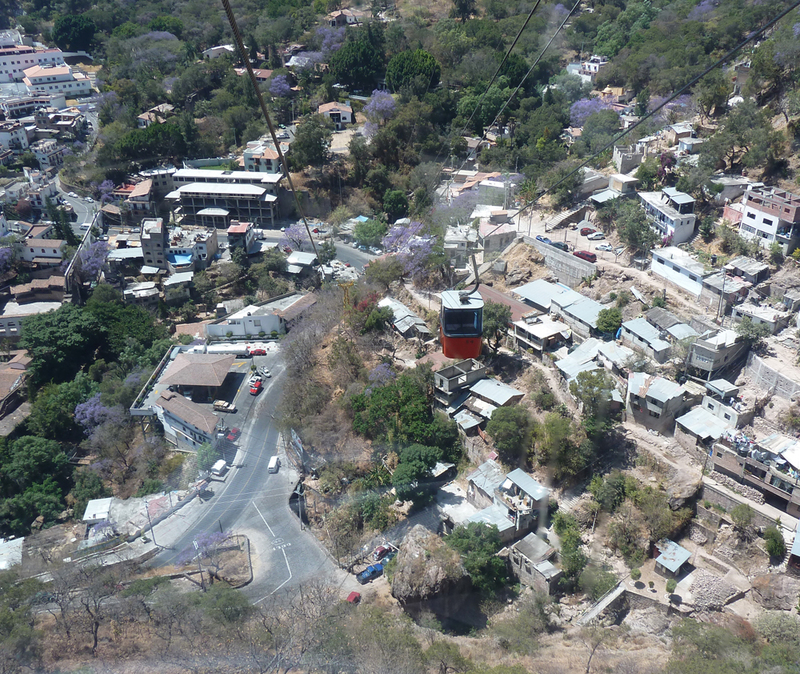 Then we took a tour to Monte Albán which tacked on a few others – the dominican convent at Cuilapan de Guerrero, a workshop where they make alebrijes – the fantastical painted animals and a black pottery workshop. The latter two were a bit too touristy but I will probably still come back with a striped armadillo or something. 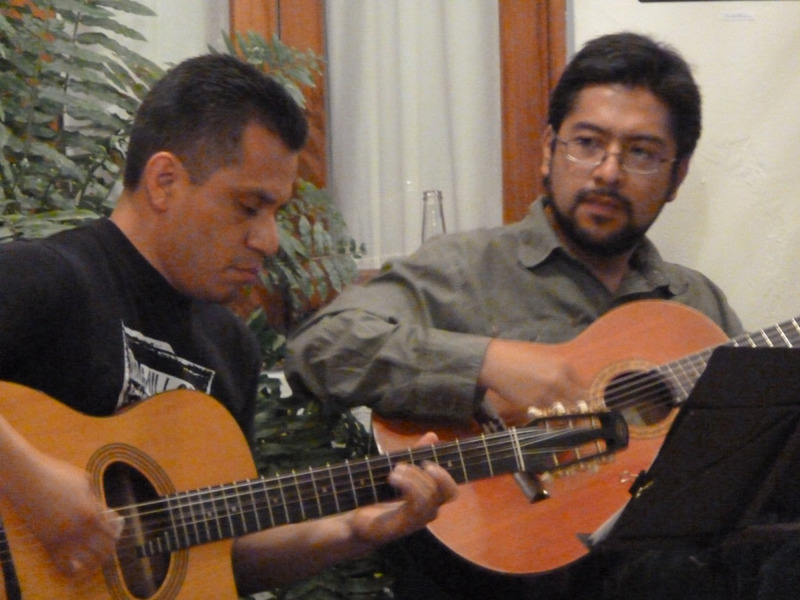 There was a photography exhibit and party at the B&B so we were treated to some local (30-something) color, music nibbles and a bit of mezcal. This page is acting up, so I’m starting page two.